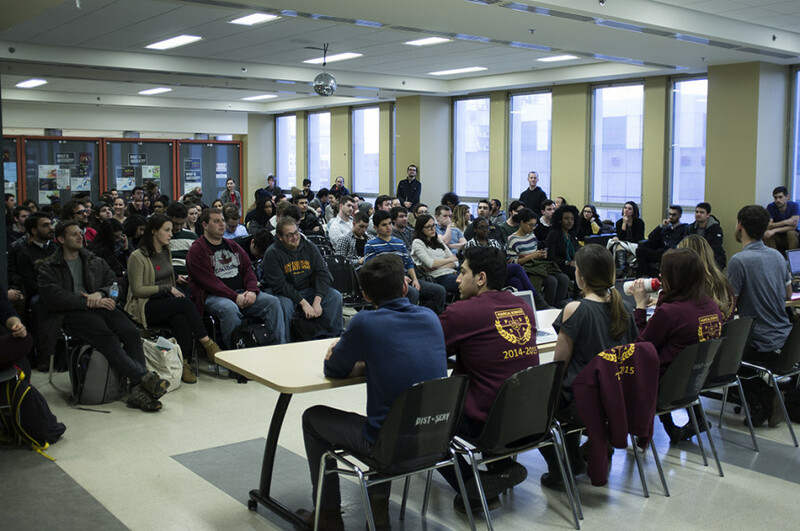 Concordia’s Political Science Student Association voted to strike at a general assembly, while the Urban Planning Association (UPA) became the first association to vote “no” at its assembly on Monday night. Political science students will be on strike April 1 and 2. The vote passed with 61 “yes” votes, 54 “no” votes and three abstentions. The UPA vote had 19 in favour, 20 against and one abstention. At another GA held last week, the UPA voted in favour of denouncing austerity measures as a symbolic gesture. This week’s motion, if it had passed, would have resulted in a one-day UPA strike on April 2. After some dialogue and a vote to amend the motion, the association decided they would be voting to hard-picket, which would have maintained a physical presence to block teachers from entering their classes. Students would have been allowed to pass. Mariah Gillis, VP Internal of the UPA, advocated in favor of a hard picket. “Perhaps if we had changed it to a soft picket the motion might have passed. But I still feel like it’s really important to have a hard picket to make it an effective action,” she said. Gillis was disappointed with the results, but she still thinks UPA students should take part in the collective action. “I would still encourage urban planning students to get out, talk to their professors, and see what sort of accommodations can be made,” she said. The UPA had extensive debate before the final vote. President of the Urban Planning Association, Vithu Namasivayam, commented on the results of the session. For the PSSA assembly, two amendments passed to include the term “non-violent” in its mandate and to change a weeklong strike to two days, which James Tyler Vaccaro motioned for. Confusion about voting occurred throughout the assembly. First, an amendment to include the term “hard-picket” passed with a hand count of 53 to 47. After a request for a recount, the amendment failed, with 50 for and 59 opposed. The second count stood, and CSU President Benjamin Prunty, acting as chair, said he probably shouldn’t have allowed a point of clarification about what constitutes a “hard-picket” before the recount, because it may have influenced members to change their vote. Toward the end of the assembly, Vaccaro motioned to vote by secret ballot instead of a hand count, which failed. By suggestion of the chair, and with a second recount, the motion to use a secret ballot passed with 78 “yes” votes to 32 “no” votes. Correction: In a previous iteration of this story, it stated that during the PSSA recount of an amendment to include the term, “hard-picket,” Prunty said he should not have entertained a recount at all. In fact, he said he shouldn’t have entertained a point of clarification that may have influenced members to change their vote before they counted hands again. The Link regrets the error.